A senior Lib Dem minister has said any cuts to the top rate of income tax before next year's general election will only happen "over my dead body". Chief Secretary Danny Alexander said the 45p rate was the "right place to be" and suggested he would veto any Conservative proposal to cut it to 40p. A cut has not been put forward, but is called for by some senior Tories, including London mayor Boris Johnson. The mayor did not wish Mr Alexander ill but said a tax cut could still happen. Mr Johnson told BBC Radio 4's Today programme: "The last thing I want to see is pointless sacrifice from the Liberal Democrats, let alone the dead body of Danny Alexander. "Sooner or later there will have to be a new Conservative manifesto and I can't believe we are going to go into an election on a manifesto to keep our tax rates higher than our competitor countries." Put to him that it would not happen before the 2015 election, given Mr Alexander's comments, Mr Johnson said: "Who can say what will happen to Danny Alexander? Stranger things have happened at sea." Mr Johnson added: "UK income tax is now higher than the EU average. That never used to be the case and I don't why it should be the case for the long term and I see no reason why we shouldn't bring it down." The coalition government reduced the top rate from 50p to 45p last year but many Liberal Democrat supporters were unhappy about the move, which the party leadership says was agreed in return for the bigger than scheduled rise in the amount people can earn before paying income tax. In an interview with the Daily Mirror, Mr Alexander - who, as chief secretary to the Treasury, is Chancellor George Osborne's number two - said his party was focused on cutting taxes for working people by continuing to raise that level. Asked about the top rate of tax, he said the current 45p rate would remain in place until the election. "I wouldn't go to cutting below 45%," he said. "I would say that would happen over my dead body. It's clearer and simpler and better to say we are going to stick where we are. We have the 45p rate and that's the right place to be." Although the Conservatives have not publicly proposed cutting the 45p tax rate, speculation that it might happen in future has been raised by a failure to explicitly rule out a cut. Pressed three times last week by Labour leader Ed Miliband on whether he would exclude any further cut to the top rate of tax, Mr Cameron refused to explicitly rule it out but he said his priority was helping low and middle earners. 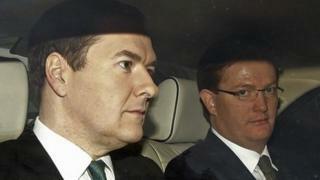 He insisted the wealthiest were paying more under the coalition than its Labour predecessor. BBC political correspondent Iain Watson said there have been mutterings from some in his party that Mr Alexander had "gone native" at the Treasury and not been arguing his party's corner strongly enough. The minister, he added, was now signalling the strongest resistance yet from the Lib Dems to tax cuts at the top of the income scale. Asked about the possibility of future co-operation with Labour, Mr Alexander joked that he had once played in the same cricket team as shadow chancellor Ed Balls. As a wicketkeeper, Mr Alexander suggested, Mr Balls "did not let anything past him", adding: "I would endorse him as a wicketkeeper." For Labour, shadow chief secretary to the Treasury Chris Leslie said: "Danny Alexander seems to have forgotten that just 10 months ago he cut the top rate of tax for the top 1% of earners. And that was after saying anybody who wanted to do this was living in 'cloud cuckoo land'." He added: "It tells you everything you need to know about David Cameron and George Osborne that they haven't ruled out cutting the top rate of tax again."